Still high off my shoot and collaboration with Detroit vs. Everybody, I decided to dedicate my first OOTD post to my Africana themed look from the shoot. I found my ankara blazer from the thrift store and immediately grabbed it and headed to the registers. 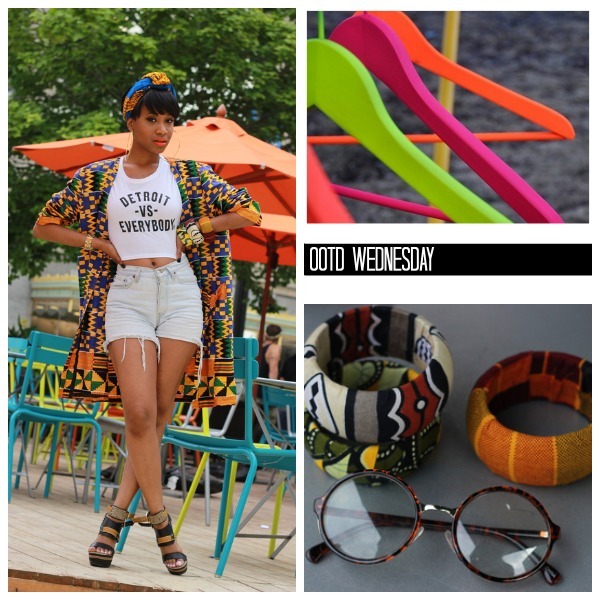 A lover of all things vibrant and printed, I have an extra special place in my heart for African print anything. My shoes are from Target and the bangles and head wrap (which is really a yard of fabric) I picked up from the Detroit World African Festival. The shorts are from a mom jean DIY project I did. If you can’t tell, I had a ball shooting this look! I love how the chairs and colors in the background played off of my look. So guys, what looks or trends would you like to see me recreate? I’m all ears and open to suggestions!